WordPress informed us that we reached a new one-day high here on September 21 when 4,754 visitors logged on. 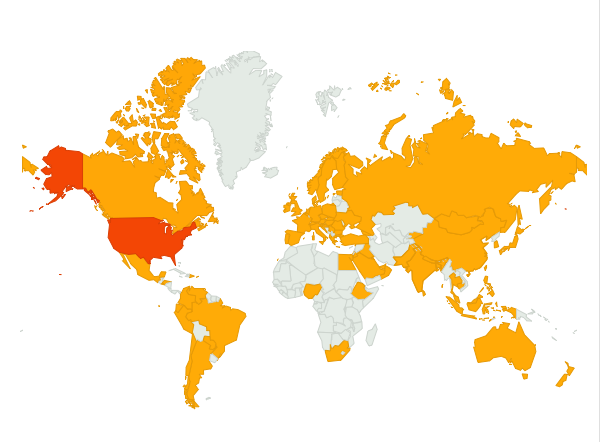 In the last seven months visitors have logged on from 81 different countries in the world (shown in color on map, below). To date in 2012, visitors here logged in from 81 countries. “PeteCrow/NASA” is a project of Seine/Harbour® Productions and is © by Seine/Harbour® Productions, LLC, Studio City, California, and by the Peter Michael Crow Trust. Endeavour in Los Angeles/ — What’s next? At LAX cranes were used to lift the Shuttle off the 747’s back instead of the Mate/De-Mate permanent device that was used at Kennedy Space Center in Florida (shown here). Each Shuttle weighs a slightly different amount when they arrive at their respective museums because of what has been left on and taken off. 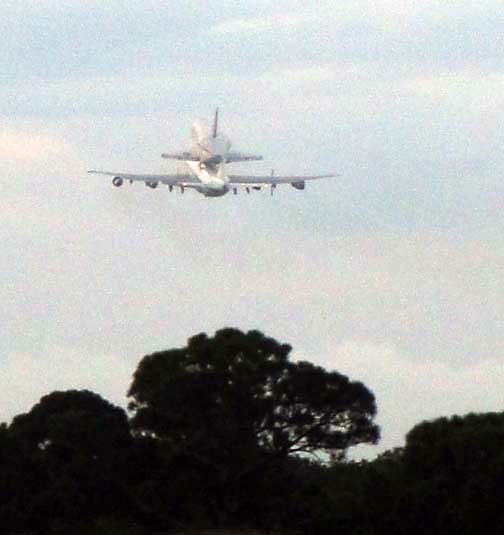 Endeavour’s flight weight from KSC to LAX was 155-tons. The Los Angeles Times has done two excellent videos on Endeavour. All are great fun and all are found HERE. Scroll around on the page to find them, and there’s also a 360-degree interactive picture on the arrival of Endeavour atop the 747 at LAX. Great stuff all! DEMATE One is a time lapse of Endeavour’s demating process which was scheduled to take about 10 hours, beginning at midnight on her day of arrival (September 21, 2012) in front of a United Airlines Hangar at LAX. ENDEAVOUR ROUTE TO CSC The second time lapse is a two-minute time lapse driving the route the Endeavour will follow through the streets of Los Angeles to the California Science Center on October 12/13, 2012. Once the demate procedure was completed from the 747, Endeavour was moved into a United Airlines Hangar. Title to Endeavour was transferred to the CSC in 2011, and Endeavour was safed up and certain alternations were made by NASA in an OPF (Orbiter Processing Facility) at the direction of CSC. 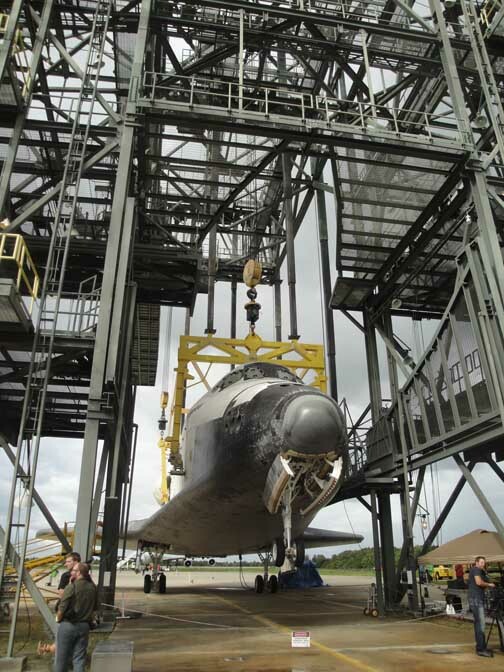 Then Endeavour was moved to the Vehicle Assembly Building for storage and Atlantis took her place in the OPF so Atlantis could be prepared for delivery to the Kennedy Space Center Visitors Center in November. Endeavour did not fly to California empty. Tucked inside here were packages of patches designed by NASA for the California Science Center which were to be handed out at the arrival ceremony at LAX in order to commemorate Endeavour’s arrival on the west coast. Endeavour is the newest of the Shuttle fleet. She was flown to California by at least one member of the crew that picked her up in Palmdale taking delivery in 1991. CBS in Los Angeles mapped it out — have a look HERE. 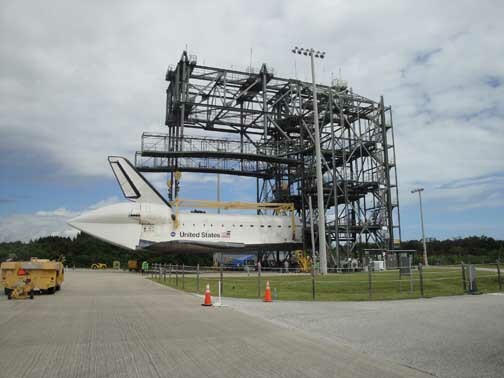 Endeavour preparing to be mated to the 747 in Florida on September 14. 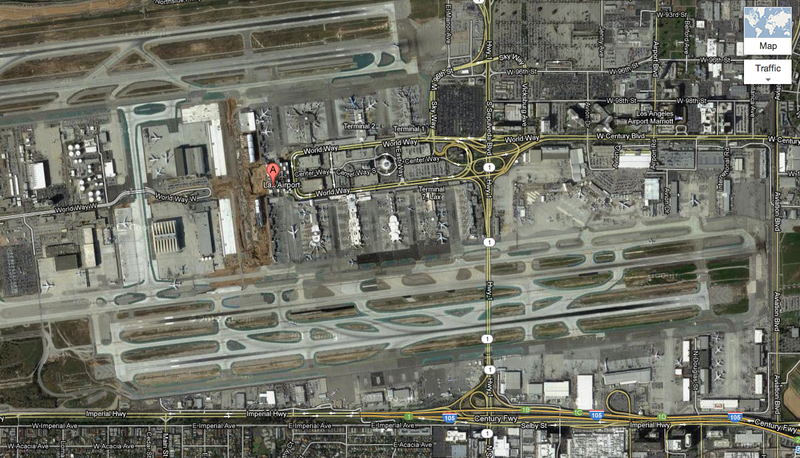 She was to be unmated from the 747 at LAX using cranes. After landing on the southern east/west runway along Imperial Highway 105, Endeavour was taken to the United Airlines hangar where she will remain for the next few weeks. A final welcoming ceremony was held for her there. The plans were for the KSC crew, lead by Flow Manager Stephanie Stilson, to begin the final readying of Endeavour at midnight Pacific time. Work was expected to be completed in 10-12 hours before Noon Saturday, September 22. 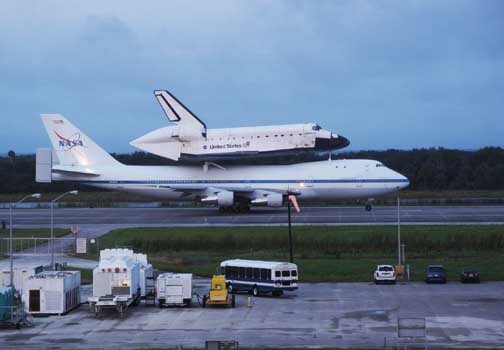 The SCA (Shuttle Carrier Aircraft) was scheduled to return to Edwards Air Force Base after off-loading Endeavour, to park and then to be abandoned. The American Space Shuttle program is almost over — but not quite. On Friday and Saturday October 12/13 Endeavour will make her way through the streets of Los Angeles to the California Science Center. Several weeks later Atlantis, now in an Orbiter Processing Facility hangar at Kennedy Space Center, will make her way a few miles south and east to the Kennedy Space Center Visitor’s Center (scheduled for November 2, 2012). And with that, the program will indeed be completed. 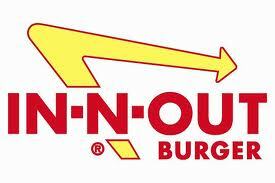 about 7 a.m. CDT on Thursday for California. turn northwest for a final pass over Houston heading west. allowed inside the perimeter fence. 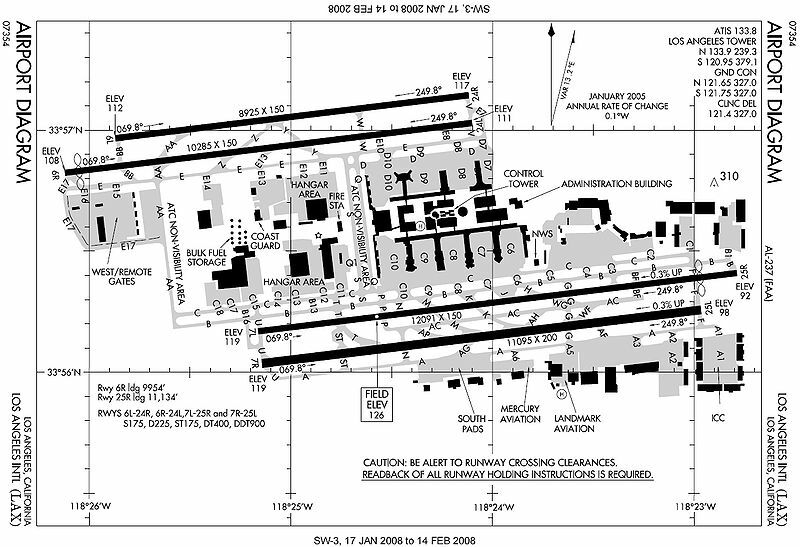 Army Air Field. Takeoff from Biggs is planned for about 11 a.m.
approximately an hour and 15 minutes after departure from Biggs. 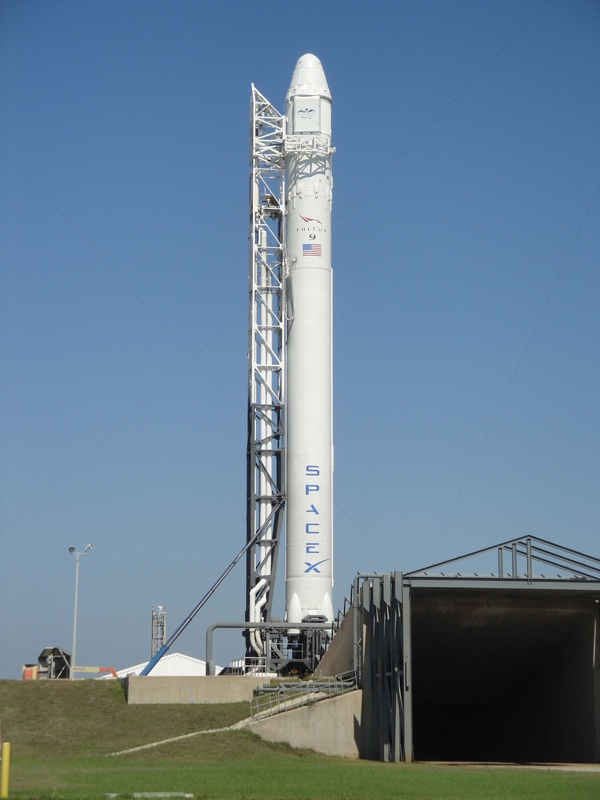 Base is scheduled for approximately noon PDT. heading into the Los Angeles area. California Science Center next month. 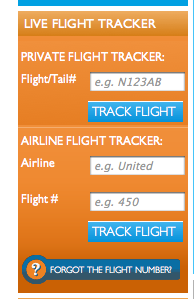 stopovers could be delayed or canceled. #spottheshuttle and #OV105, Endeavour’s vehicle designation. 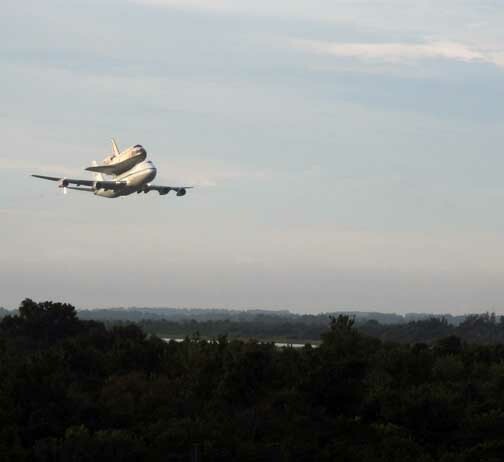 Endeavour took off from Kennedy Space Center about 7:18am and after flying the Visitors Center, the VAB and a part of the coast, circled back and came back low over the SLF in a final salute. She then turned west toward Houston/Ellington. Before taking off from the north to the south, Endeavour/747 taxied the entire length of the SLF, stopping midway down the runway for media and guests. Rain threatened and KSC officials debated holding the Endeavour’s departure for a third day, but in the end gave her the greenlight to go. 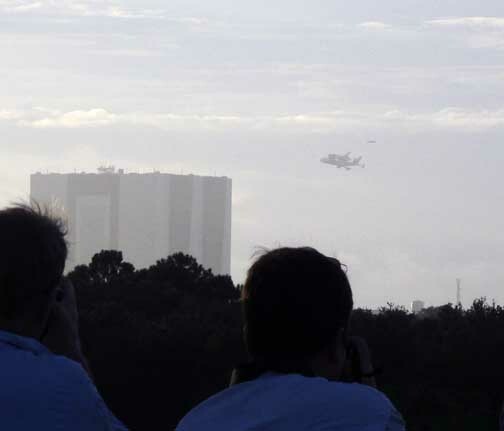 Far in the distance, Endeavour banks past the Vehicle Assembly Building where for 20 years her journeys back to space began.